Samsung's Notebook 9 Pen is a slender 360-degree laptop that's committed to the stylus way of doing things. Of course there's a keyboard, but this convertible laptop wants to make it easy for you to scribble, tap, and create with your hand. Announced Wednesday night, the Notebook 9 Pen and several other Notebook 9 models will ship in Korea first, then the United States in the first quarter of 2018. Prices were not disclosed. Why this matters: Samsung announced the Notebook 9 Pen and several other laptops on Wednesday night to get ahead of the news deluge at CES. Samsung is a relatively small player in the huge U.S. PC market, so every model counts. By focusing on pen input for the Notebook 9 Pen and a few other models, it has a chance of attracting stylus enthusiasts. The Notebook 9 Pen is slender and light, but it looks like it could be very fast with its 8th-generation CPU. We'll highlight that and other attributes in this list of specs and features. CPU: Samsung's up-to-date with Intel's 8th-generation Core i7 CPU. We're impressed by the power and efficiency of this chip, especially the quad-core goodness that makes it nice and fast. GPU: Integrated Intel HD, which will manage your everyday applications just fine but won't have you fragging bots in your favorite game. Display: 13.3-inch FHD (1920x1080) touchscreen. The size and resolution are just average, but the maximum brightness is a high 450 nits. Of course, if you crank it up all the way, it will use more battery power. Storage: Up to 512GB NVMe PCIe SSD. That sounds like a nice drive, but we don't know what the lower-end options are. Ports: One USB-A, one USB-C, one HDMI, and an SD card slot. For a laptop this slender, this is generally as much as you get. The Notebook 9 Pen also has an integrated fingerprint reader and an IR camera for facial recognition via Windows Hello. 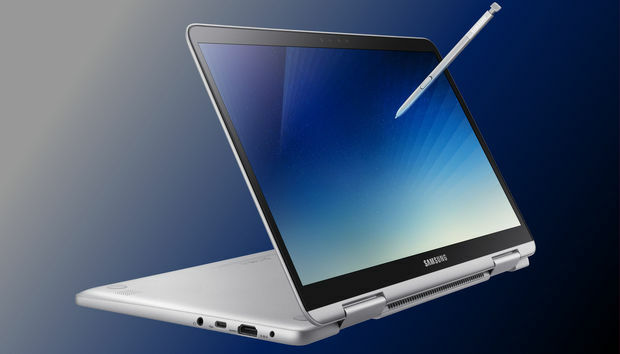 Chassis material: The all-metal magnesium-aluminum alloy that Samsung calls Metal12 helps the Notebook 9 Pen maintain its slender profile. 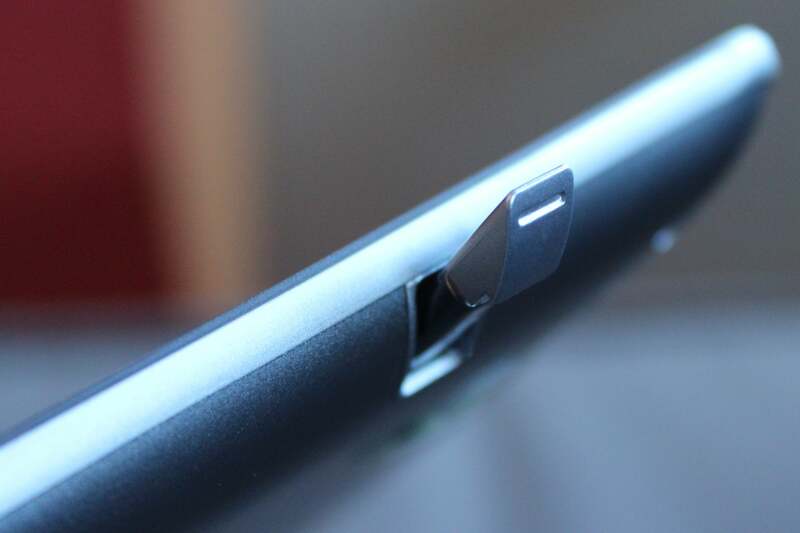 The S-Pen tucks into its own slot on the front of the Samsung Notebook 9 Pro. Pull the pen out of its slot, and Samsung's own suite of pen apps, called Air Command, launches immediately. You can use the apps to take notes, draw, or use handy shortcuts. This is on top of the pen capabilities built into Windows 10, or the pen-friendly apps you can get from the Windows Store. The Samsung Notebook 9 Pen is arguably drawing itself into a bit of a corner by putting 'Pen' into its name, as if that's all it could do. It's got a full keyboard and the same chops as any slender laptop, with 360-degree versatility. The 8th-gen CPU is a great start for performance. It's very slim and light. We'll see how it looks, feels, and acts when we get a chance to see it at CES in January.